Toeing the Putt: Is This a Good Way of Handling Downhill Putts? for handling fast downhill putts. Toeing the putt is a technique to lessen the energy transfer to the ball on a downhill putt. 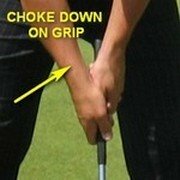 However, it is better to grip down the shaft rather than putt the ball off the toe of the putterface. The idea that you should deliberately putt the ball off-centre is commonly associated with a fast downhill putt. It is sometimes used with a right-to-left breaker. Downhill putts on fast greens are difficult in that the break is more pronounced than a putt of similar length up the slope. There is also the attendant danger that, as the ball gathers speed, it can overshoot the hole and leave a long come-back putt. The reason or rational for using the toe of your putter is to do with energy transfer. 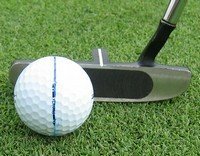 Putts that are struck on the sweetspot or centre of percussion have the maximum energy transfer and travel the farthest. With putts that are struck off-centre, there is an energy loss and therefore they don’t travel as far. So a way to deaden a downhill putt is to putt the ball off the toe of the putter. Start the ball off on the aimline (target line) you have chosen. Get the ball to the hole so it has a chance of falling in. Control the end speed of the ball so that it matches your read. Anything that makes achieving these three objectives more difficult is probably not a good idea. This technique begs the question that you can manage this task successfully. Not many amateurs have the coordination and control to be able to strike the ball consistently in the centre of the putterface. In my opinion a better way to reduce the power at impact and achieve a softer roll is to shorten your grip on the putter. At least this does not mess with your aiming – that is starting the ball off on the aimline you have chosen. Hitting the ball off the toe tends to open the face of the putter and direct the ball higher than the stroke otherwise would send it. The occasional golfer would be better served by trying to centre every putt, and by using the length of the backstroke and a down-the-shaft grip with soft hands to control the direction, distance, and speed of a slick putt. In the words of Frank Thomas, former Technical Director of the USGA, "Putting is a part of the game where you absolutely must build up consistency in your stroke. What you should be doing is trying to eliminate as many variables as possible." Toeing the putt introduces another variable – how far out on the toe should you hit it? This is not the way to build a consistent putting stroke.